The outdoor recreation industry responded last week with a unified repudiation of the White House's announcement to sharply reduce the size of two national monuments, but there is little indication that this — or other controversial positions, ranging from H-1B visa cutbacks to the still-unsettled fate of DACA “Dreamers” — would prompt America’s corporate leaders to sever ties with President Donald Trump. “You’ll see most companies, unless it’s something directly affecting their business, will try to stay out of the fray,” Andrew Ward, an associate professor of management at Lehigh University, told NBC News. Trump suffered his greatest rebuke from America’s CEOs in the wake of the white supremacist rally in Charlottesville over the summer, when the president refused to unequivocally condemn the activities of neo-Nazis and violence that left one woman dead. He was forced to disband two advisory councils after a wave of CEOs announced that they would quit. 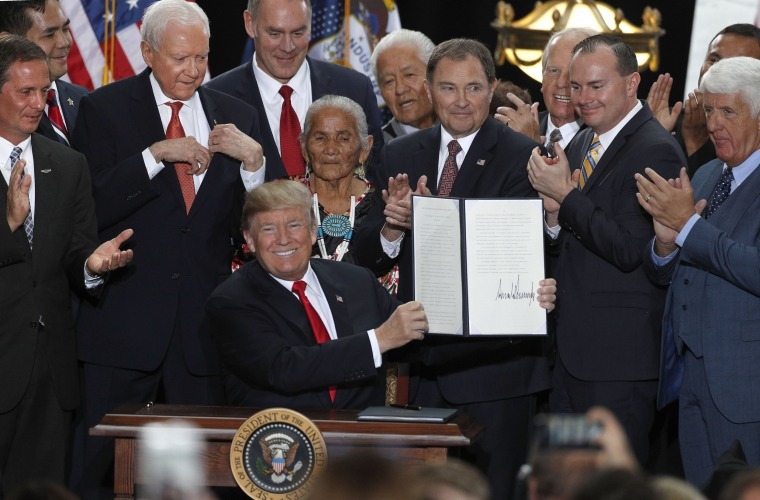 Apart from the opposition to slashing the amount of protected land at Bears Ears and Grand Staircase-Escalante National Monuments, though, criticism since then has been tepid. “Most CEOs are careful to remain on the fence. They’re not critical — but they’re not supportive,” said Erran Carmel, professor of information technology and analytics at the American University. "There’s always some risk involved with companies taking a political stance, depending on what the issue is,” said Ted Marzilli, CEO of YouGov BrandIndex. “By wading into a political issue, you’re setting yourself up to do well with half of consumers,” he said. In today’s polarized culture, this means opening the company up to anger from the other half, a risk too far for many corporate chiefs, Marzilli said. “With social media, boycotts can spring up at a moment’s notice." The company, in conjunction with a group of other conservation organizations, filed a lawsuit in U.S. District Court in Washington, D.C. last week that names Trump, Interior Secretary Ryan Zinke, as well as the head of the U.S. Forest Service and deputy director of the U.S. Bureau of Land Management, as defendants. Spokeswoman Corley Kenna said preserving the planet has been in Patagonia’s DNA since its inception, and its core customer has beliefs about public land preservation that align with that of the company. “The response from our customers has been overwhelmingly positive,” Kenna said. This isn’t surprising, Marzilli said. YouGov BrandIndex consumer perception data showed a positive response to both Patagonia and outdoor retailer REI when they spoke out against the monument reduction. “It fits with their brand positioning, which lowers the risk,” Marzilli said. Kenna acknowledged that the unified response on the part of the outdoor recreation industry gives Patagonia’s activism more clout. “Part of the reason we’ve been successful is other companies in our industry have also taken such strong positions,” she said. Outdoor footwear brand Chaco, a division of shoe manufacturer Wolverine Worldwide, is one of the many other companies voicing opposition to the reduction of the national monuments. “There aren’t a lot of policies coming from this administration that seem to favor the outdoor business at this time,” said Chaco president Seth Cobb. While most of the responses on the brand’s social media channels have been supportive, Cobb said the minority voicing dissent weren’t a deterrent. Ultimately, whether or not speaking out against Trump fits with their brand seems to be the deciding factor. Marzilli said brands catering to a politically like-minded audience, as well as those with more of a business-to-business model, could fare better when taking a political stand than mass-market consumer brands. As to the question of what kind of situation might spark a more widespread reaction to White House policies or positions from America’s corner offices, management experts suggested it would take something big. Carmel suggested that a sharp downturn in the economy could prompt corporate leaders to reconsider their support — or, at least, their silence.